“The Snow Queen” is based on the original classic fairy tale written by Hans Christian Andersen and first published in 1845. The story centres on the struggle between good and evil as taken on by a little boy and girl – Gerda and her brother Kai. Wishing to create a new world of eternal winter, where the polar wind cools human souls and the clearness of lines obscures human emotions, the Snow Queen has blanketed the landscape in ice and set out to destroy all art. According to the predictions of a magic mirror, the most recent threat to the Snow Queen comes from the master glassmaker Vegard, whose mirrors reflect not only appearances but souls too. One day the polar wind takes away Vegard and his wife Una, but they manage to hide their baby boy Kai and daughter Gerda. 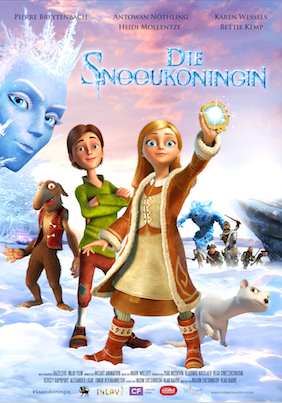 Time passes and the servant of the Snow Queen finds Gerda’s brother Kai, whom she believes to be Vegard’s successor. When Kai is abducted and taken to the Snow Queen’s palace, Gerda embarks on a journey across the icy wonderland, accompanied by her pet ferret Luta and Orm the troll. Facing difficult obstacles and finding new friends on her quest to set Kai free, she has to defeat the Snow Queen and warm the hearts of people everywhere in order to save the world. Beautiful scenery, a classic story and great animation quality from Russian animation company Wizart ensure that this is a classic adventure film which appeals to an international audience.